f.24 View of Panjim from the Mandovi River showing the Viceroy's palace and boat. ' Goa'. Col. Johnson was at Goa in 1806.
bl.uk > Online Gallery Home	> Online exhibitions	> Asia, Pacific and Africa Collections	> f.24 View of Panjim from the Mandovi River showing the Viceroy's palace and boat. ' Goa'. Col. Johnson was at Goa in 1806. 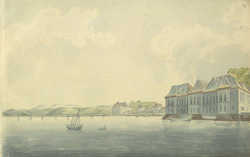 Water-colour painting of Panaji from the Mandavi River by John Johnson (c.1769-1846). This image is from a sketch-book of 36 drawings (36 folios) depicting scenes chiefly in West India and Mysore, c.1795-1801. The Portuguese came to Goa in the 16th century for the lucrative spice trade and dominated the area for four centuries. Panaji (New Goa) is located at the mouth of the Mandavi River on the Arabian Sea and was a small village until plague at Old Goa (Goa Velha) drove the residents out in the mid-1700s. In 1759 Viceroy Dom Manuel de Saldanha de Albuquerque, Count of Ega moved his residence from Panelim (near Old Goa) to Panaji. The old castle of Adil Shah was remodelled and a palace was built for this purpose. Panaji was made the capital of Goa in 1843.